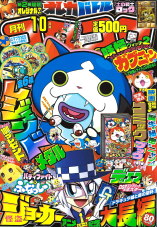 CoroCoro Comics is a magazine that covers a number of kids' franchises in Japan. 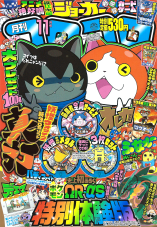 The magazine is primarily known among Pocket Monsters fans for getting exclusive first dibs on news regarding the newest Pocket Monsters video games, TV series, movies, trading card game, and more. It is released around the 15th of every month. Daigo, the Champion of the Houen Region, tells two twin boys the legend of Groudon and Kyogre. One shaped the land while the other shaped the sea and both have the power, if awakened, to expand their territory at the expense of the other's. Daigo asks the boys, Alpha and Omega, what they would think if he told them that the two pokemon are still around and are sleeping somewhere in the Houen Region. The two respond by saying that they'd try to capture them! As the two argue over which pokemon is better, Daigo interrupts and tells them that they won't be the only ones after the legendary pokemon. Elsewhere, two criminal organizations known as the Aqua-Dan and the Magma-Dan plot to capture the legendary pokemon and discover the secrets behind something known as "Primal Reversion." Later, both Alpha and Omega run off, ready to face their newest adventure. 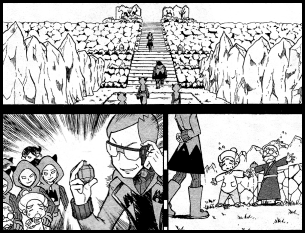 A young boy named Omega and his pokemon - Numaclaw, Minun, and Hasubrero - arrive at the Magma-Dan's secret hideout. His goal? To capture the legendary pokemon Groudon! Omega had heard from Daigo that he could find out more about Groudon if he went to the organization's hideout but he doesn't know where to start. So, he does the only thing that makes sense to him: walk into the room featuring the largest number of Magma-Dan grunts and loudly ask where Groudon is! 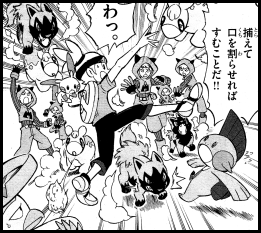 The dozen or so grunts immediately assume that Omega is an intruder from the Aqua-Dan and have their pokemon surround him. Omega quickly realizes that he won't be welcomed with open arms and has his pokemon attack. After making quick work of the grunts' Numel and Pochiena Omega wonders if this "Magma-Dan" is some kind of criminal organization or something. The grunts hear his judgmental questioning and respond by declaring that the Magma-Dan aren't evil criminals but are, on the contrary, the saviors of humanity! If they can capture Groudon then they'll be able to increase the world's land mass which will then enable humanity to expand to new parts of the planet! 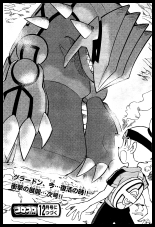 Omega declares that he'll be the one to capture Groudon so he can show it off to his younger brother Alpha. One of the grunts asks how he even plans to do that in the first place. After all, he doesn't even know that he needs a special "orb" in order to revive it! The grunt then says that as soon as they finish fixing up their submarine they'll be able to go to the underwater cavern where Groudon is sleeping! Omega thanks the grunts for the information as they realize that they've probably said too much. Meanwhile, the leader of the Magma-Dan, Matsuba, examines an orb he's taken from an elderly couple atop a mountain. Omega is about to board the submarine the Magma-Dan has parked nearby when a Bakuuda comes from out of nowhere and tackles him! 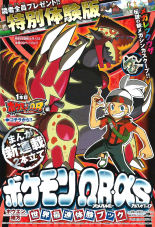 Bakuuda's Trainer is soon revealed to be Homura, one of the Admins of the Magma-Dan! After Omega's Minun and Hasubrero are defeated by the Fire-Type, Homura orders Bakuuda to use Rock Slide on their Trainer. As Omega struggles to free himself from the rubble he wonders what will happen to all the pokemon on the planet if the Magma-Dan's dream is allowed to come true. Homura responds by saying that he doesn't care about any of that and that their goal is to create the perfect world for humans, not pokemon. Bakuuda stampedes toward the partially buried Numaclaw. 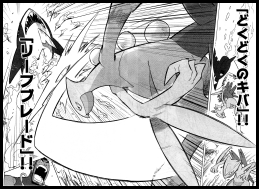 Omega frees himself from the rubble and leaps in front of his pokemon to protect it from the oncoming attack. As everyone braces for impact Numaclaw manages to break free and jumps in front of its Trainer at the last second! The pokemon glows, repelling the attack, and then evolves into Laglarge! 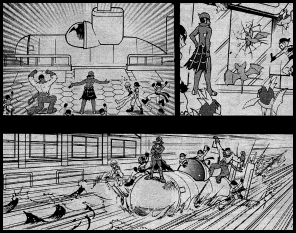 Before Bakuuda realizes what's going on Laglarge is ordered to use Waterfall and knocks it out with the Water-Type attack. He may have lost the battle, Homura concedes, but their leader Matsuba has already left for Groudon's lair in the Western Seafloor Cavern, located in the ocean just outside Minamo City. But how will Omega get there? Later, Omega and Laglarge arrive in Minamo City and look out at the water. Omega tries to swim to the cavern but he soon figures out that he won't be able to make the trip all by himself. He is soon approached by Daigo who lends him an oxygen tank so he can survive underwater. He also tells Omega that he'll leave the Aqua-Dan up to him. After saying goodbye Omega calls on his Whaleko and orders the pokemon to use Dive. Before long they locate the entrance to the cavern. Once inside Omega is rushed by a new group of Magma-Dan agents. During the ensuing battle a Water Stone falls out of Omega's pocket and triggers his Hasubrero's evolution into Runpappa! The newly evolved pokemon uses Nature Power to help clear the rest of the grunts out of the way. Omega searches the inside of the cavern until, finally, he discovers the chamber where Groudon is sleeping. 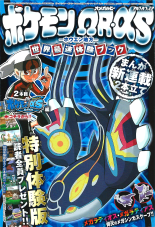 The title page calls this chapter "the first one" (１本目), indicating that it takes place before the events of that month's Pokemon Alpha Sapphire Indigo Wisdom chapter. A flashback in the chapter indicates that Omega's Hasuboh originally belonged to Alpha and that Alpha's Taneboh originally belonged to Omega. The two of them traded pokemon when they were younger. A young boy named Alpha arrives at the Aqua-Dan's secret hideout. His goal? To capture the legendary pokemon Kyogre! Omega had heard from Daigo that he could find out more about Kyogre if he went to the organization's hideout and so he enters through the air vents above. Suddenly one of the air ducts gives way and dumps Alpha and his partner Juptoru into a room filled with Aqua-Dan agents! The grunts send out their pokemon to surround the intruder so Alpha sends out his Plusle and Konohana to battle. 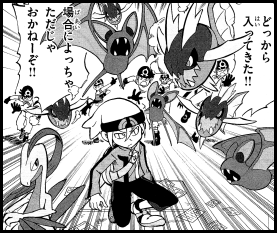 Alpha's pokemon take care of the Aqua-Dan's Kibahna and Zubat before long. Alpha casually glances over at a monitor and, unbelievably, finds the information he had come there for gathered all in one spot. Lucky! Alpha learns that he needs an "orb" to revive Kyogre and that in order to reach its lair he'll have to have access to a submarine like the one parked in the Aqua-Dan's hideout. He then learns that the Aqua-Dan got that submarine by stealing it from the Kaina Shipyard in Kaina City. The grunts hear him wondering if the Aqua-Dan's really just a group of thieves and respond by declaring that they're not; their goal is to resurrect Kyogre so it can use its power to expand the amount of water in the world and create a paradise for pokemon! Alpha doesn't like the sound of that and decides to stop the evil team. Alpha is about to board the submarine when a Samehadaa leaps out of the water and attacks the group! Plusle and Konohana are knocked out so Alpha has Juptoru scatter Leech Seeds everywhere in an attempt to capture their assailant. However, Samehadaa is able to outswim the attack. The Samehadaa's Trainer, Aqua-Dan Admin Ushio, compliments Alpha on making it as far as he has but says that he's too late because they're already prepared to depart. 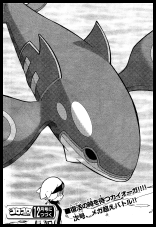 Alpha reasons that he won't be able to meet Kyogre without that submarine but that in order to get onboard he'll have to take care of Samehadaa first. Alpha orders Juptoru to jump into the water. Samehadaa is about to chomp down on its opponent when Juptoru swims up and covers the Water-Type's eyes! 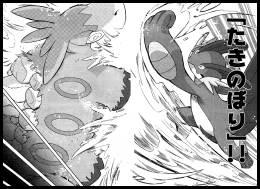 Ushio's pokemon thrashes around violently and eventually leaps out of the water in an attempt to shake off Juptoru. Once above water we see a large number of Kibahna, all done in by Juptoru's Leech Seed from earlier. Juptoru leeches the energy from the wild Water-Type pokemon, restoring its health just enough to trigger its evolution into Jukain! Ushio isn't worried, though, since Jukain is still quite beaten up from its earlier encounter. Samehadaa rushes over and begins chomping at its opponent but Jukain proves itself to be too fast for the beached shark pokemon. Ushio orders Samehadaa back in the water, so Jukain follows. Jukain soon outpaces Samehadaa, turns around, and uses Leaf Blade to finish it off. Alpha tends to his pokemon's wounds while Ushio curses his loss. The Aqua-Dan Admin turns to Alpha and tells him that their leader Aogiri has already left for Kyogre's lair in the Eastern Seafloor Cavern, located in the ocean just outside Minamo City. But how will Alpha get there? Later, Alpha arrives in Minamo City and looks out at the water. He figures that he needs both a special move for his pokemon and a special tool in order to make the dive and turns to Daigo, who had been behind him the whole time, and asks him if he's right. Daigo congratulates Alpha for figuring everything out so quickly and gives him what he needs to make the trip. As Alpha dives underwater he recalls something he saw written on the Aqua-Dan's monitor about "Primal Reversion." What in the world could that be? Alpha eventually finds the entrance to the cavern. Once inside he is rushed by a new group of Aqua-Dan agents. Alpha fishes a Leaf Stone out of his pocket and gives it to Konohana, triggering its evolution into Dartengu. The newly evolved pokemon makes quick work of the grunts' pokemon. Alpha searches the inside of the cavern until, finally, he discovers the chamber where Kyogre is sleeping. 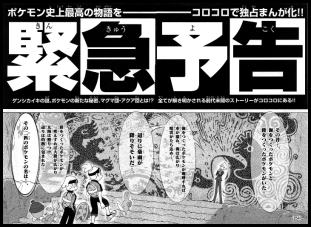 The title page calls this chapter "the second one" (2本目), indicating that it takes place after the events of that month's Pokemon Omega Ruby Crimson Passion chapter. A flashback Daigo has to Omega's failed attempt to swim to the Seabed Cavern in this chapter confirms this. Dogasu's Backpack is a fan-created website Pocket Monsters (Pokémon) is © 1995-2014 Nintendo / Creatures Inc. / GAME FREAK, Inc. / Pokémon USA / 4Kids Entertainment Inc. No infringement of copyrights is meant by the creation of the web site.